Nintendo Ad Features Aussie Medievalists! 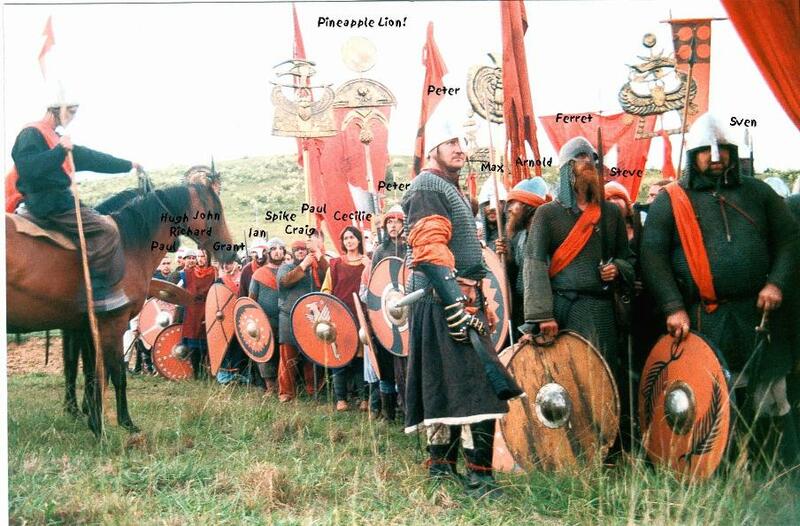 At the end of January 2000, Christobel gathered about 150 medievalists from NSW, Victoria and Queensland to be extras in an amazing advertisement which is currently being shown by cinemas and TV across the US and Europe. The crew was very impressed with the way we got into character (check out the faces in the charging scenes! ), and how we could endure the weight of armour (some did three 15 hour days in kit). There were many comments on the quality of the costume and gear we brought, which really enhanced the look of the ad. No game... the N-64 is now available in 5 or 6 various colors. In the commercial, there is an army, sort of Dark-ages generic, done up in the colors of each new system. One is a silly Braveheart painted Scot horde, but the rest are really cool Viking-age N. European. There's tons of real maille shirts (no silver sequins), a Gjermundbu helm, a Coppergate helm, stacks of huscarl-axes & centergripped rounds... probably wouldn't pass with Regia Anglorum, but still cool-looking. Brodir, March 21, 2000 04:20 PM Note - the shields were mostly agency-supplied props so they could be painted in the right colours, the odd polearms are also props.